Linda Brown, of landmark case Brown Vs. Board of Education, died on Sunday. March for Our Lives took place across the country on Saturday to call attention to the atrocity of gun violence in the United States. Laughing Pig Theatre’s first Monologue Cafe addressing abuses of privilege and power also took place over the weekend. Our mission? To address violence, oppression, and abuses of privilege in our local community by sharing experiences and engaging in dialogue. We collected true stories, then placed those stories in the hands of 11 performers who brought each one to life. On Friday evening we followed the show with a processing session for writers, performers, and audience members. The cafe brought together a diverse, gracious, and enthusiastic group. It was inspiring to engage in the conversation with everyone who came out to participate, support and grow with us. Writers and performers, we at Laughing Pig Theatre are stunned by and in awe of your courage, heart and humor. Without you all this wouldn’t have been possible. An enormous thank you goes out to: Julia Wallace, Patsy Parker, Dori Honovi, Darcy Cochran, Pina, Belen Markus, Arielle Hurst, Mindy Judson-Garcia, Tayo Talabi, Avery Volk, Sawyer Walter, Mara Nadolski, Katlyn Roberts, and Amy Palmer. Writer, Dori Honovi meeting the actors who performed her work post show: Darcy (left) and Avery (right). What a powerful trio! Warming up at the thunder dome. Tony Moschetti (back corner) facilitated the workshop portion of our evening. Each one teach one is at the heart of our approach to theatre and community engagement, and it is you, our community who make this work (and play) possible. Big love to you. If you had fun, pass it on! If you missed us on Friday fear not! There’s plenty more in store from Laughing Pig Theatre. Check out our Events Page for details. A Great Night of Improv! Friday, January 12, marked our inaugural event: A Night of Improv. And we at Laughing Pig couldn’t be happier with the outcome. Ok…if we had all got signed for the Daily Show or SNL, that might have been better (Trevor, Lorne: we’re out here). Barring that improbability, it was a roaring success: about 30 guests came for the improv show, and about half of you stayed for the workshop. And we all had a great time! Based on your feedback, we’ve done just what we’ve always hoped: create a safe, inclusive space for everyone to be involved. And for that, we owe you all a BIG THANK YOU: for showing up, for showing out, and for showing your support for local theatre arts (and the financial support is a BIG plus)! With such a great turnout, you can bet Laughing Pig will bring you another night of improv. Between now and then join us at Mesa Arts Center’ Acting Studio for our Open Improv Jam, Wednesday nights at 7:30pm. We’ll learn basic improv skills, play different improv games, and have an opportunity to socialize and build community around our common interests: the stage…or comedy…or just being silly for a couple hours. February 9: Improv Techniques for Dialogue – in this 90-minute workshop Ada McCartney will share her teaching and acting expertise by training you in different ways to use improv to improve group dialogue and drive effective, critical conversations. This is a great workshop for students and educators of all levels, professional facilitators, community organizers. Really, anyone who talks to groups of people can benefit from these techniques. March 9: Long Form Improv Show & Workshop: join us for another night of improv, as we delve into “long form” improv theatre. Not as widely seen on stage, these games will focus more on building the world, delivering cohesive scenes, and showing off our acting skills. But dont worry: there will be plenty of laughs to go around. March 23 & 25: Laughing Pig Theatre’s Monologue Café – we’re looking for your original stories related to and inspired by experiences of sexual assault, the abuse of privilege and power, and challenging the status quo. These works will be performed March 23-25, at the Mesa Arts Center. Submissions are due January 27, 2018. Quick S/O to AlphaGraphics for the prints and stickers that make us look good. Another S/O to Jessika Smyers for the brilliant photos she took. As always, many thanks to Mesa Arts Center for providing a space for us to play. 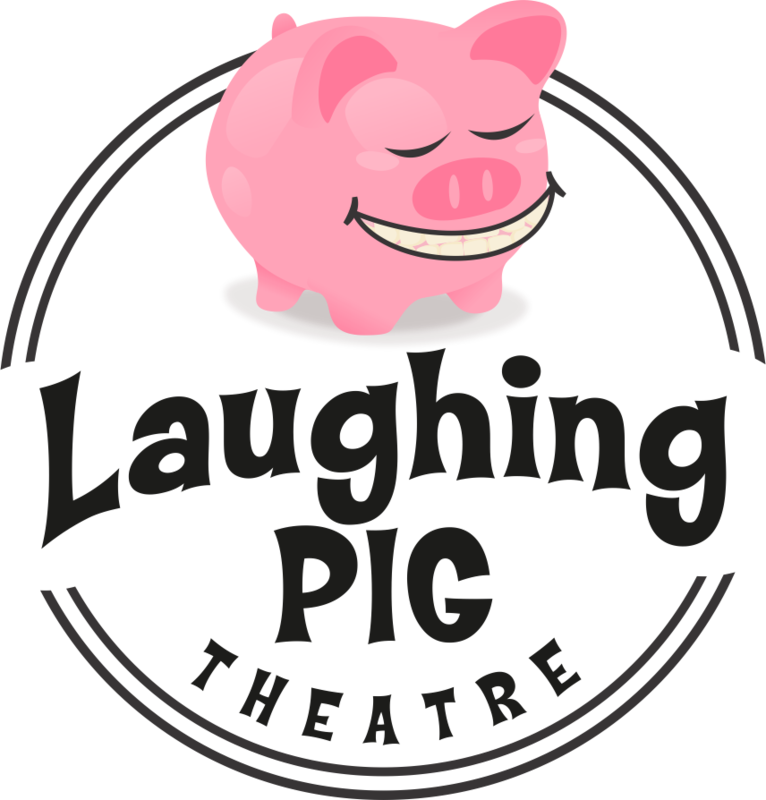 And, again, Thank You for joining us and helping to build a community around Laughing Pig Theatre. In this photo (2016, by Tony Holt) a thick, blue rope drapes over the edge of clean ship rail, worn and sturdy. Then, the eye is directed overboard and into the silvery chop toward a strong horizon. Laughing Pig Theatre is brand new, growing into its body, rope draped over railing, suspended between earth and sky. We are scrappy, curious, and ready to ride.